2. Cut each pita into 8 wedges and arrange on a baking sheet. Bake in preheated oven for 10 to 12 minutes or until crisp. Let cool. 3. In a small bowl, mix together cheeses. 5. Spread the pita wedges out onto a large parchment paper-lined baking sheet. Sprinkle with half the corn, olives and tomatoes and 1/3 cup (75 mL) of the cheese. Repeat with remaining corn, olives and tomatoes. Sprinkle all over with remaining cheese. 6. Broil for 3 to 4 minutes or until heated through and cheese is melted. 7. 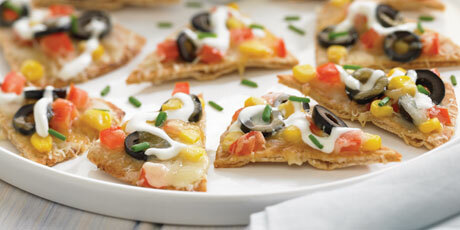 Slice nachos onto a serving platter and top with sour cream.